Heads exploded around the tech world today after Apple CEO Steve Jobs finally announced the long-awaited Apple iPhone during his Macworld 2007 keynote in San Francisco. The iPhone, as Jobs proudly dubbed the device to thunderous applause (take that Linksys), will be three devices in one: a cell phone, a wide-screen iPod with touch controls, and an Internet communications device. Cingular is the lucky carrier (apparently the companies have patched up their relationship following the Motorola Rokr bust). We haven't gotten to hold an iPhone yet, but we're just as excited as the next person to finally write down our first thoughts, and we won't sleep until we get our hands on one. Check back near the product's June release date for our full review. 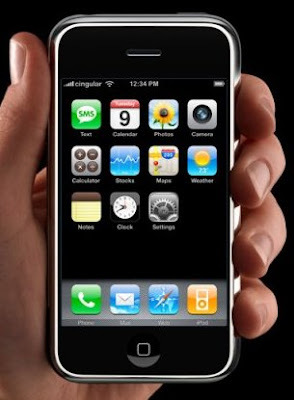 As has been widely rumored for months, Cingular (soon to be AT&T) will be the sole iPhone carrier. Both Apple and Cingular stores will sell the phone starting in June. Europe will get it in the fourth quarter, and Asia will have to wait until next year. Finally, the U.S. gets something first! Good thing we have a few months to save our pennies. The 4GB model will cost $499 with a two-year contract and $599 for the 8GB version (also with a two-year contract). Again, that's a bit high when compared to other carrier-supported music phones such as the Sony Ericsson W810i, particularly since you're locked into a contract with one carrier. To be successful, an Apple phone has to sport an iconic Apple design--the Rokr's dull design did it no favors. Fortunately, Apple fulfilled our expectations this time with a smooth design and an innovative interface. Say goodbye to traditional cell phone buttons--this phone is all touch screen, all the time. With only one hardware control (a "home" key), iPhone's real estate is dominated by a huge, 3.5-inch display. From what we call tell, the device looks beautiful with a resolution of 320x480x160 pixels per inch (the highest iPod resolution yet, according to Jobs). The videos and photos look great, and we love that the "smart" screen shifts automatically to a landscape orientation when you start to play a video. One giant touch screen controls the phone, and no stylus is needed ("Yuck," Jobs said). Use your fingers to type messages and e-mails on an onscreen keyboard--Jobs promises onscreen typing will be faster than on a standard smart-phone keypad, but we'll believe that theory when we actually get a device in our hands. (And speaking of yuck, what about all that finger grease?) But we admit the scrolling feature looks especially promising as Jobs had only to slide his finger across the display. Of course, such a large display makes for a large phone: the iPhone measures 4.5x2.4x0.46 inches. No, it won't slide into smaller pockets, but it joins the similarly sized Palm Treo 750, and its weight (4.8 ounces) is mostly standard for a handset of this size. Of course, the slim profile is noteworthy as well. We're a tad surprised Apple has jumped on the thin phone bandwagon, but trim design, after all, is the cell phone trend of the day. 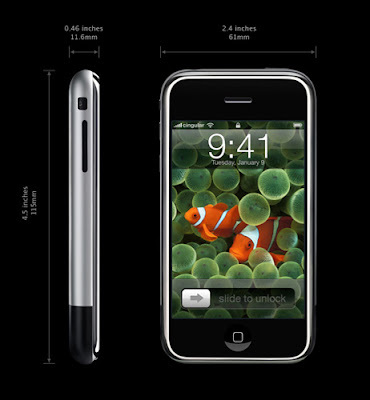 As Jobs made clear, iPhone is thinner than both the Motorola Q and the Samsung BlackJack. Though we're pleased Apple made it a quad-band (GSM 850/900/1800/1900) world phone, we're disappointed the iPhone's data support tops out at 2.5G EDGE networks. Considering the multimedia-friendly feature set, the omission of any 3G compatibility is a bit bizarre, particularly since Cingular now offers UMTS and HSDPA. We wouldn't normally spend much time on voice mail, but Apple pulled a new trick out of its hat with Visual Voicemail. Rather than forcing you to call your voice mail and waiting to browse through multiple messages to hear the one you want, Visual Voicemail displays all the messages you have in a list, similar to an e-mail in-box. All you have to do is select the message you want and listen away. It's tough to truly evaluate the iPhone's capability as a music and video player without some hands-on experience, but a cursory look at the product shots and details gives us some idea; that, and the fact it's closely related to the highly rated iPod music player iPod. In short, the iPhone is sure to offer an easy-to-use media playback interface, and the breadth of content offered by iTunes (its compatible service) ensures you'll never be wanting for music or video files. Of course, the touch-screen interface will take some getting used to for users who are accustomed to the iPod's Clickwheel. The iPhone, which will be offered in 4GB and 8GB capacities (flash memory), doesn't have any restrictions on how much of that memory you choose to fill up with media content--no 100-track limit, as is the case with the Motorola Rokr. The convergence device also takes a step away from its iPod brethren by offering a built-in mic for audio recordings. And unlike most cell phones, the iPhone offers a standard 3.5mm audio jack, which will work with all mainstream stereo headphones. There's no FM radio but that's nothing new from Apple. One thing is for certain: the 3.5-inch wide-screen display is much better for full-length movie viewing than the 5G iPod's comparatively paltry 2.5-inch screen. And Apple's new partnership with Paramount really helps to fill out the movie category in iTunes. If there's anything we have to complain about, it's that the video player isn't offered as a standalone device, sans the phone capability, (which is sure to mark up the premium on the price). Of course, if that happens, we'd like to see something above the max 8GB of memory. iTunes content and video load on the phone via a USB computer connection--unfortunately, as far as we know there are no wireless downloads--and the iPhone comes with an iPod connector. Beyond the music player, the iPhone runs on Mac OS X and promises a 2-megapixel camera, a photo-management tool that rotates the display for landscape photos (like with videos), support for Google Maps, conference calling, a speakerphone, and text and multimedia messaging. We imagine there will be personal organizer applications as well, but Jobs kept mum on such fine details. Connectivity options also look promising with stereo Bluetooth (thankfully), Wi-Fi (a huge plus), POP3 and IMAP4 e-mail, and a Safari Web browser. The free push Yahoo e-mail app looks especially cool since we won't have to wait for syncing with a PC. The iPhone also comes with some unique sensors that detect how you're using the phone and change the display accordingly. A proximity sensor knows when you bring the phone to your ear and then dims the screen and shuts off the touch screen. The ambient light sensor adjusts brightness and saves power, and the accelerometer knows when to switch between landscape and portrait orientation. After months of iPhone speculation, we were sick of the device even before it came out. But now, well, we have to admit it's quite lovely. The vivid display is especially attractive, and we like the sleek, minimalist design. The touch screen may involve a learning curve, but we're excited to try it out. The iPod functionality will no doubt draw many, and in particular, we're glad to see world phone support, the Yahoo e-mail app, stereo Bluetooth, and Wi-Fi. On the downside, we were hoping for wireless iTunes music downloads. And it's too bad Apple stopped short of 3G support. Also, we're hoping that Apple introduces a standalone touch-screen iPod without the phone element as not everyone will want a convergence device. And here's the biggest caveat: Phones are only as good as the calls they make, so we'll have to wait for our final assessment once we get a review product. As for battery life, Apple is promising five hours for calling or video and 16 hours in music mode. Overall, however, and despite the high price, we predict an iPhone success. The iPhone will garner interest simply because it exists and, as such, has great potential to move music phones into the mainstream. Nokia's Xpress music phones and Sony Ericsson's Walkman handsets present a strong challenge on some level, but Samsung's new Ultra Music probably stands to take the biggest hit if the two devices go head to head.